Sem fyrr eru ARKIRNAR úti um allar trissur að sinna vorverkum: taka þátt í uppákomum, leggja útland undir fót, útskrifa nemendur úr lista- og handíðaskólum. Þrátt fyrir annir eru fundir nokkuð reglulegir og undanfarna mánuði hefur dagskráin hljóðað upp á margvísleg örnámskeið. Meira um örnámskeið ARKANNA síðar. Spring fever is hitting us ARKIR! Not that there is much sight of summer in Iceland… Minus 5-8 °C at night, cold wind blowing at daytime. Otherwise we are busy working and traveling, taking part in all kinds of events, graduating art students from various schools of art and craft. Still we manage to meet regularly and have had great fun refreshing our book making with our own micro-courses. More on that later. Það ber reyndar svo vel í veiði fyrir þá sem vilja kynna sér bókband og bókverkagerð að í haust standa til boða námskeið hjá Endurmenntunarskóla Tækniskólans. Í október 2012 hefst námskeið í Bókbandi fyrir byrjendur og í haust verður sjálf örkin Anna Snædís með námskeiðið: Bókagerð/Handgerðar bækur. Allar upplýsingar fást hjá Tækniskólanum. Looking for courses on book art in Reykjavik? At The Technical College in Reykjavik there are two courses next autumn (2012). 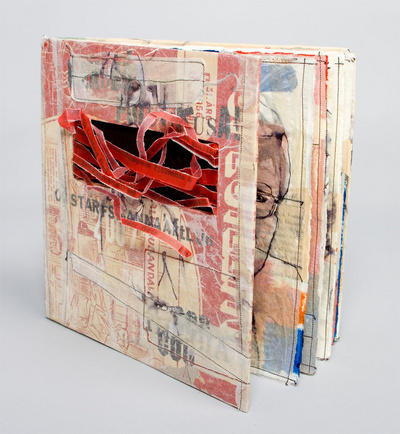 Bookbinding for beginners and our own ARKIR member Anna Snædís gives a course in book art: Book art / Handmade books. Check out the links! HANDVERK OG HÖNNUN stóð fyrir sölusýningu nytjalistamanna í byrjun maí í Ráðhúsi Reykjavíkur, en næsta sýning verður í nóvember. Örkin Sigurborg stóð vaktina frá 3. til 7. maí og sýndi textíla og handgerð og prentuð kort eins og sjá má í kynningu á vef Handverks og hönnunar. Myndir frá sýningunni má skoða á Fésbókarsíðu H&H. Contemporary ARTS AND CRAFTS FAIR was held in Reykjavik City Hall in May where artist working in textile, ceramics, glass, jewellery, horn and bone, wood, leather and fish skin exhibited and sold their works. 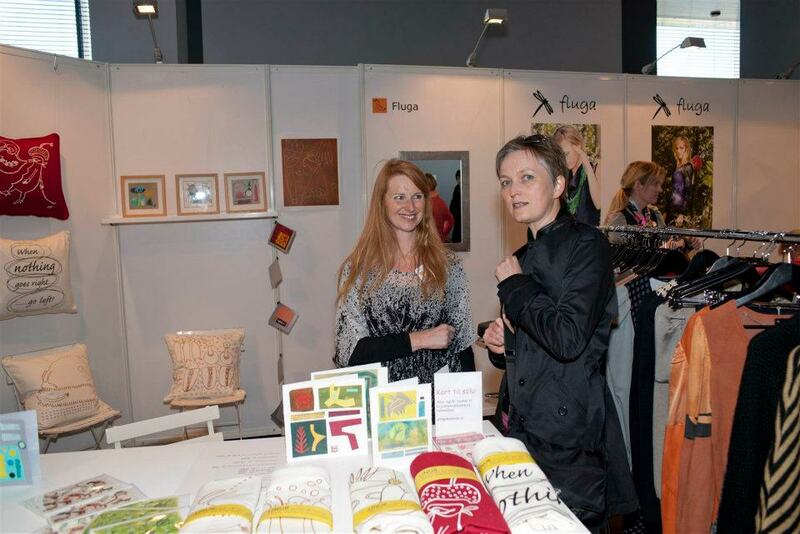 One member of ARKIR, Sigurborg, made her way to the show, exhibiting printed textiles and handmade cards. Read more about HANDVERK OG HÖNNUN – CRAFTS AND ART and take a look at photos from the event by using the links. (left: Ljósmynd/photo © Sigurborg Stefánsdóttir. Sigurborg í sölubásnum – Áslaug í innkaupaleiðangri. Barnabókahöfundurinn og leikskáldið í ARKAR-hópnum brá sér á skrímslaþing í Melasveitinni á dögunum. Áslaug var þar með vinnustofu ásamt meðhöfundum sínum að bókunum um skrímslin tvö, þeim Kalle Güettler og Rakel Helmsdal. Sömu helgi var síðasta sýning á leikriti Áslaugar um skrímslin, sem frumsýnt var í desember í Kúlunni, barnaleikhúsi Þjóðleikhússins. Á þinginu voru því mikilir fagnaðarfundir. Eins og sagt er frá á vef Forlagsins þá er von á nýrri bók um skrímslin í haust. 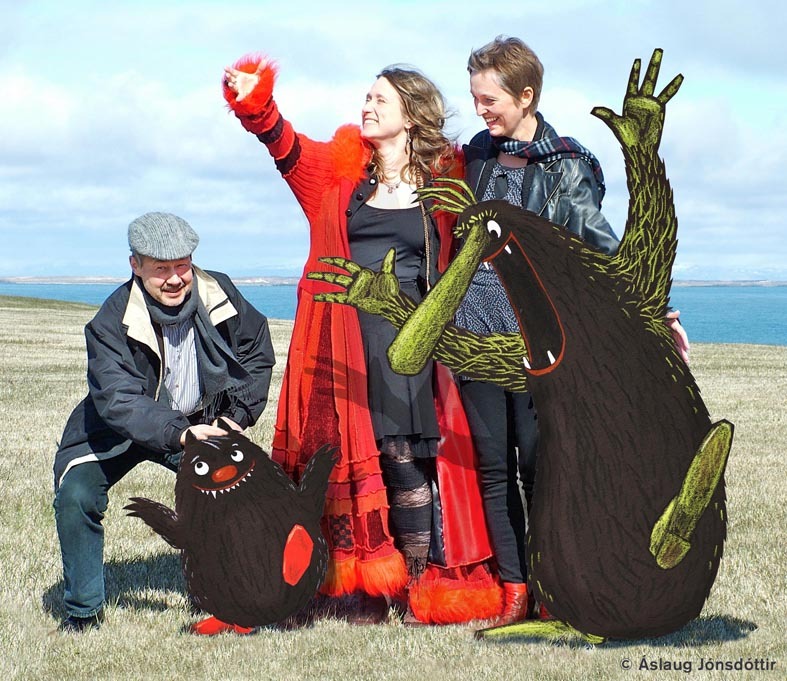 Áslaug, the children’s book author and playwright in ARKIR, has been spending time with monsters. Her co-authors of the monster-series, the swedish author Kalle Güettler and faroese Rakel Helmsdal came to Iceland for a workshop and a happy gathering of monsters. At the same time it was the last performance of Áslaug’s children’s play about the two monsters, staged at Kúlan in the National Theater with premiere in December 2011. All the Nordic monsters had a ball and according to Forlagið publishing, a new monster book is to be released in the fall.